Russian police have broken up protests across the country against a planned increase in the retirement age. More than 800 protesters were detained and some beaten with batons, the rights monitoring group OVD-info says. The rallies were called by the jailed opposition leader Alexei Navalny, who has capitalised on widespread anger against the reforms. Concessions by President Putin, whose popularity has suffered as a result, have failed to stem the discontent. The protests coincide with elections for 26 heads of Russia's 85 regions, including in Moscow, which are being held on Sunday. OVD-Info says 839 people were detained in 19 cities. The largest number was in St Petersburg, where 354 were held, the group said. 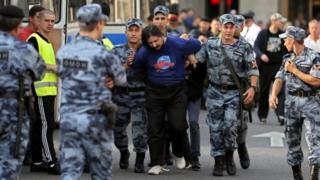 Another 129 were detained in the city of Yekaterinburg in the Urals, while Moscow saw 36 arrests. From 2019, the retirement age for men and women will start being increased gradually. By 2036 it will have risen from 60 to 65 for men and from 55 to 60 for women. Mr Putin softened the initial plan to raise women's retirement age to 63. Russian men have a life expectancy of 66 while for women it is 77, the World Health Organization says. The long-time anti-corruption campaigner has said the series of short prison terms he has faced are designed to disrupt his political activity. He has vehemently denied all charges against him. Barred from state TV, Mr Navalny was prevented from running against Vladimir Putin for president in March. "Putin and his government have plundered the budget for the past 18 years," Mr Navalny's team said in a statement prior to Sunday's protests. "All that time they assured us there would not in any circumstance be a rise in the pension age. And now they are putting it up." Mr Putin has said the move to raise the retirement age for men and women had been delayed for years and risked causing inflation and increasing poverty. "Any further delay would be irresponsible," he said. Unions have however warned that many will not live long enough to claim a pension. Tens of thousands have rallied across Russia in recent weeks. Unusually for the country, the issue has drawn protesters from all sides of the political debate.